Hyderabad resembles a war zone ever since Home Minister P Chidambaram made the Srikrishna committee report on Telangana public on January 6. Incidents of violence have been on the rise ever since. While the students wage the battle on the roads, the people of Telangana have pinned their hopes on the political Joint Action Committee for Telangana. Heading this JAC is Professor M Kodandaram, who has repeatedly stated that they will not settle for anything less but statehood status for Telangana. 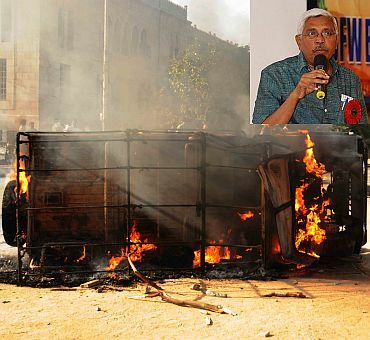 In this interview with rediff.com's Vicky Nanjappa, Prof Kodandaram says that looking at the atrocities being committed on students by the Andhra Pradesh government, the political JAC has decided to act fast and not wait until February to start their aggressive campaign for a separate state. What are your thoughts on the Srikrishna report on Telangana? We have no thoughts; we have been cheated yet again. It is not as though we were expecting anything from the report. We were sure that it would go against us. We had questioned the constitution of the committee, especially when the Union government had made it clear that the formalities for formation of a separate state had begun. There was no meaning in such a committee and we had boycotted it from day one itself. It is unfortunate that the students are provoked into acts of violence. All people of Telangana believe in peaceful protests and that is what all of us had intended to do. However, there appears to be a design to provoke the students. This is a democratic set up and people have every right to protest. Why should there be restrictions on such protests and why should there be a gag on the media to cover the protest. This has hindered free flow of information. No government can prevent the media from giving information from the public. 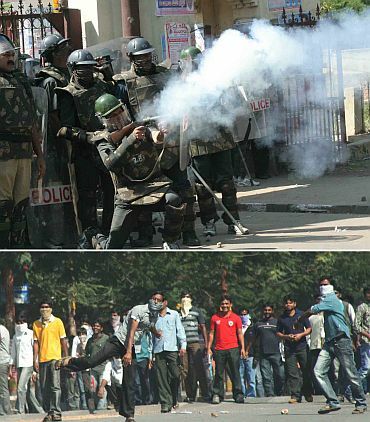 The police claim that they had fired rubber pellets to curb the mob. Don't you think the police is doing its duty? 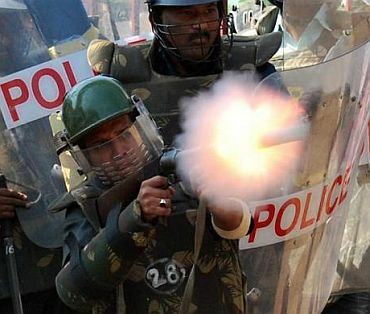 There is a youth called Ravi Kumar who sustained very serious injuries after police firing. If these were rubber pellets, why was he seriously injured? Such police force is illegitimate in a democracy. Moreover, we have information that some plain-clothed policemen started pelting stones to provoke the students and now they want to give a colour that it is the students who started this problem in the first place. I would also like to draw your attention towards the Supreme Court order, which says paramilitary forces should not be deployed around education campus' and also that police can enter into a campus only with the prior approval of a three-member committee. All these norms have been flouted. What is the road map ahead now? We had planned on starting an agitation from February. However, we do not want to wait any longer. We had planned on a complete pen down agitation where all offices, education institutions would be shut until a separate state is granted. 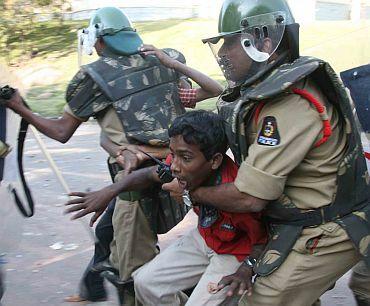 However, looking at the police atrocities, we think we should not wait any longer. Our agitation will now commence this month itself. There is no point in waiting any more. Could you describe for us the exact nature of what the agitation would be? We will resort to blocking roads. All educational institutions will remain shut and all government officials of Telangana will not report to work. We have decided to adopt a non-cooperation policy and will continue to do so until our demand for a separate state is met. Enough is enough, the common man cannot be taken for granted and our children cannot be tortured any more. Is there is a need to resort to violence? Why do you think it is we who have resorted to violence? We are the people who have been deprived of our legitimate rights and the government cannot play around with our emotions any longer. It is like the situation we had during emergency where facts cannot come out in the open and there are gag orders. This is not democracy. The students wanted to have a peaceful demonstration. Instead, the police fire upon them and do not even provide proper medical facilities. Will you try and talk to the Union government on this issue? No, that question does not arise. The time for talks is over. The ball is in their court and they need to act. The Congress MLAs and MPs have issued an ultimatum to the Union government stating that if the bill for Telangana is not passed in the budget session, they would all quit. What are your thoughts on this? Let us see what happens. It is not enough to sit in chambers and issue statements. If they want to move around freely and peacefully, they have to come to the streets and fight the battle. They will have to fight until the bill is passed. If they backtrack or do not join the agitation then trust me they will face a social boycott.